There are three reasons why the original 1987 Robocop, while no cinematic masterpiece, still remains a cult classic with audiences. The first is its violence: its gore and unflinching approach to bloodshed is certainly over the top but stylised to the point where it becomes enjoyable. The second is its satirical elements: it had something to say about business conglomerates and the twisted steps they can take to achieve financial and popular gain, again to the point where it becomes enjoyable. The third is that it’s just plain fun to watch: come on, who DOESN’T want to see a melty man getting run over by a car? Once more, all to the point where it becomes… oh, you know the drill. Now take away all of those. You’re left with a dull, bland studio project that does not find its own footing. That would be its new remake, a disappointingly stale update of the film’s themes. 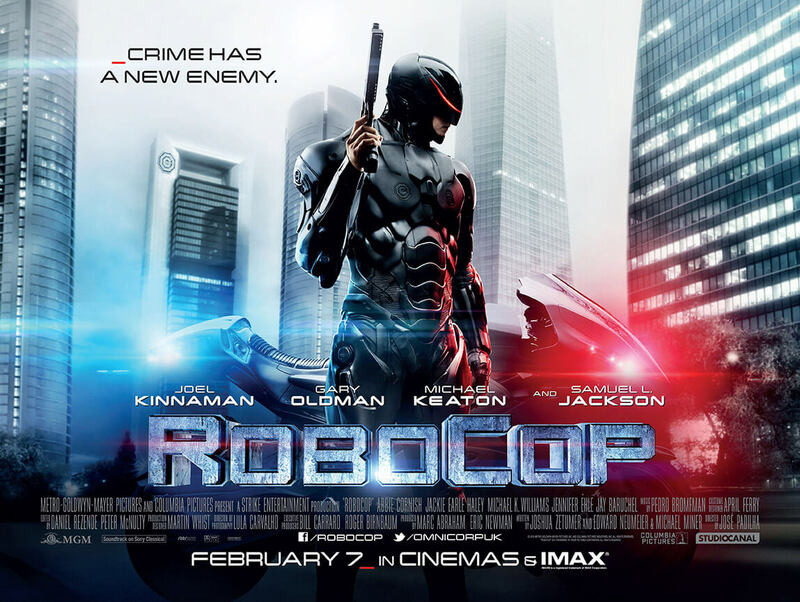 This is especially lacklustre because the whole idea of Robocop could actually work in modernised environments. Looking at society as it is now and how technology is growing faster with every minute, it would have made for a timely social commentary as it did nearly thirty years ago. However, director José Padilha clearly wasn’t on the same level as us and made it into a generic and boring sci-fi action movie. Actually, even that would be inaccurate since there is surprisingly little action in this film. Most of the scenes seem focused on trying to hammer in the satire it wants to convey but never quite manages it, leaving little room for any of the action scenes to shine or take centre stage. But even when there is action, it’s shot so frantically with enough shaky-cam to last us a nuclear winter that we’re never allowed to sit back and enjoy it. It’s difficult for audiences to be invested when we can’t even see what’s going on. However, it’s even more difficult when we cannot even make an emotional connection to any of the main characters. Joel Kinnaman, as the titular half-man, half-machine, is completely charismaless and almost as robotic as the machine he is meant to be playing (and that’s before he even wears the suit for the first time!). A large chunk of the film is spent with his family, including wife Abbie Cornish, but their chemistry together is non-existent and they hardly even share a line with each other that lets us in on their relationship. Cornish is saddled with a thankless role that requires her to do nothing but emote for her emotionless on-screen partner (and the character he’s playing). Meanwhile, Michael Keaton overacts in the cardboard villain role while Gary Oldman sadly collects another paycheck as a scientist who puts Robocop together, and mostly seems confused why he’s even in this movie. Samuel L. Jackson wins the prize for “Most Underused Actor” award, unfortunately, for a role which basically serves to feed us exposition and poorly hammered-in social subtext (his “robophobic” comment is a little on the nose). Like most remakes, especially ones of popular movies like this one, it ends up feeling pointless. Although we have established that the plot and themes of Robocop can work in a modern spin, is there really anything new brought to the table that the original can bring anyway? Here, nothing feels like it was gained or lost and it all leads to an underwhelming anti-climax that leaves everything virtually incomplete. Perhaps they’re trying to cram in as much material for a future sequel. However, if Robocop v.2014 doesn’t comply, then why should we be on board for any forthcoming follow-up? Robocop is a clear example of studio product; giving its audience nothing but poorly-handled action and expecting us to take away some biting social satire from it all. Of course it doesn’t, and if you want it done properly then there’s a 27-year-old version that’s still fresh for the taking.